Constructing a bio that’s not over the top but isn’t ho-hum either is a dilemma for many job seekers. The thing is, you don’t want to sound like a braggart, and yet you don’t want people to under-estimate your qualifications or credibility either. 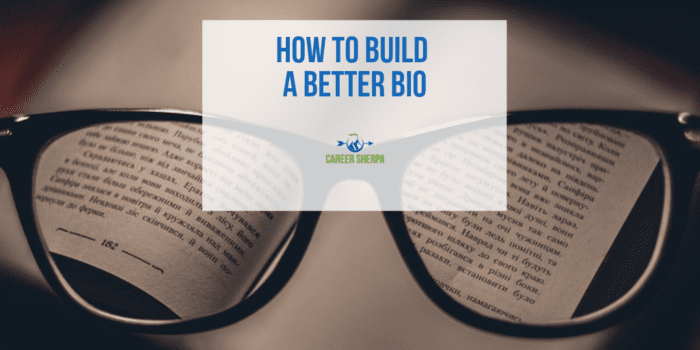 Writing a bio is both and art and a science- hopefully, these suggestions will help you find just the right blend of interesting, intriguing, promotional, and truthful. Who will be reading/listening to your bio and what do you want them to remember about you? If you are presenting at a conference or event, consider the attendees’ interests and be sure that your written bio highlights information that is relevant, memorable and builds credibility. Is your target audience contemporary, traditional, creative, or conservative? You will want your bio’s style to appeal to their style as well. 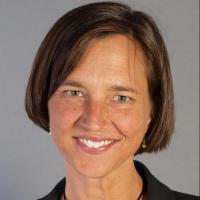 Take a look at the speaker bios from conferences. Pay attention to author/blogger bios. One word of caution- if everyone in your industry is writing long, seemingly boring bios, you may not want to buck the trend. However, if you want to get some creative ideas to jazz your bio up a bit, try reading the bios of marketing professionals, celebrities, startup founders, authors, or other big names. These bios are often professionally crafted or the people writing them have creative writing skills. No two people are alike, it is therefore highly unadvisable to lift someone else’s information. Quick Tip: Enlist the help of someone who can objectively edit/wordsmith your bio! What are your 2-3 most important qualifications? What problems are you good at solving and who benefits? What is one major success? What got you where you are today? What words have others used to describe you? What keywords do you want to be associated with? Brainstorming the answers to these questions can help you decide what is important for you to include and focus in on. You may not use all of this information, but perhaps thinking the answers through will offer you greater insight. Quick Tip: Remember to use the information your audience will feel is most important first. You don’t need to include your entire work history. Most people will never read your full bio if it is too long. There is a fine line here between divulging too much information and establishing trust by providing enough information for people to feel they know you. So what is the ideal length? There is a growing trend towards shorter bios. Some online bios limit the number of characters you can use, such as Twitter, to 160 characters. In these instances, you must shorten your bio using the most valuable keywords. Quick Tip: Having a longer version and a shorter version saves time in the long run. Use the right keywords to focus your message. Update all your social profiles (LinkedIn, Twitter, and Facebook), gear your message toward the people you want to reach on each platform. Social networking profiles increasingly include the words “I,” “me,” and “my”, rather than the stuffy third-person. Use the same version of your name across all bios for improved search engine results. Add a fun fact about you to grab attention. Always include contact information and links to the most prominent social networks. Begin spreading the word by updating your online profiles. Any place you have the opportunity to post your bio, do it! Update your LinkedIn Summary. Don’t forget to include the bio in your about section on Facebook., When you use the same wording consistently, it improves your ability to build an online presence. If you don’t have a Google profile, now would be a good time to create one. It is a great way to own some digital terrain. 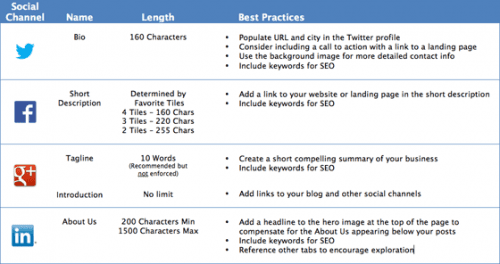 Use this cheat sheet to create bios across social media channels. Thanks to Unbounce for this helpful reference sheet. Quick Tip: To see a full list of social profiles and whether you “own” your name, check these two sites: Namechk.com and Knowem.com. Do you have an About.me page? This is a free virtual placeholder and gives you a web presence plus the opportunity to educate visitors on who you are. It allows you to include links so people can learn even more about you. You can learn more about it here.